publications and in public and private collections. Kathy is a Master Signature Member and former Director and officer of the Pastel Society of Colorado. She is also an Associate Member of the Pastel Society of America and a Signature Member of the Pikes Peak Pastel Society. She serves on the Board of Directors of the Denver-area Scientific and Cultural Facilities District (SCFD) and was formerly an appointed member of the Adams County Cultural Council. 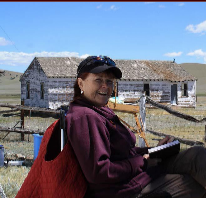 She is the past President of the Rocky Mountain Society of Botanical Artists, and a former member of the Board of Directors of the American Society of Botanical Artists. Kathy has studied with a variety of instructors, including both pastel and oil painters (Desmond O'Hagan, Jill Soukup, Duane Wakeham, Colleen Howe, Bruce Gomez, Dennis Rhoades, Terrie Lombardi, and Tony Ortega) and botanical artists (Jean Emmons, Carol Woodin, Kate Nessler, Martha Kemp, Scott Rawlins, Angela Ovary, Marg Leggitt, and Libby Kyer). "My work is an attempt to distill light through the use of color. Distillation is defined as the process of retaining the essential feature or components of something, in this case light, while removing nonessentials. I began my career as a botanical illustrator. Illustration is all about meticulous, time-consuming, detailed accuracy. All the "rules" about botanical art were extremely confining artistically. So I took a pastel workshop with the hope that it would loosen me up, since it is practically impossible to get the same level of detail with pastel. But what I discovered was not only that I was able to be looser and go bigger, but that the intensity and range of colors available in pastel (no mixing involved!) allowed for a luminosity that I had not been able to achieve in botanical art (using colored pencil, watercolor, or graphite). When I first started in pastel, I was still pretty "tight" in my execution -- I spent tons of time on the background drawing, putting in lots of detail. Over the years since, I have been able to simplify the shapes and focus the light through color to get more of the essence of the subject than just a photorealistic representation. Even so, I remain more detailed with the animals that I paint. I think that if an animal drawing isn't exact and correct, it will throw off the viewer's eye. As a result, I still tend to put more details into the animals themselves, but have gotten more simplified with the environment within which the animal exists, and I play more with the colors I use. Nothing makes me happier than animals of every kind, so spending time painting them is a double bonus! I hope that viewers will see in my work the wonder and reverence I feel for nature and light. I invite them to stop and study each piece and gain the same appreciation I feel for the natural world we live in. I find myself smiling when I contemplate the majesty of the world, and the most gratifying feeling I experience as an artist comes when I see a hint of that same smile on the face of someone viewing my work."